The first recorded member of the Lyte family was William le Lyte mentioned in 1255. 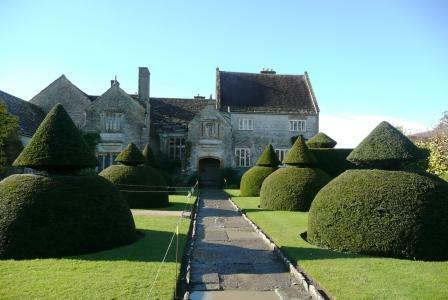 The family gave their name to their manor house near Somerton in Somerset. The Cary name apparently comes from the name of the small River Cary which runs close by the estate. The first part to be completed was the Chantry Chapel finished in 1348. The Great Hall was built by Thomas Lyte during the 1460s. 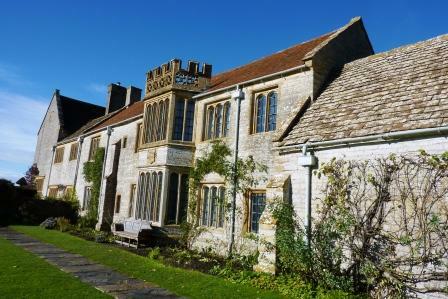 This oldest part of the manor can still be seen quite clearly in the photographs taken from the east in November 2012. The main entrance Porch and Screens passage would once have divided the servants and domestic buildings on the right (now a newer house) from the old Great Hall and main living area on the left. The small middle wing is the later Oriel room. Above are the Upper Hall and Oriel Bedroom. On the far left coming forward is the original Chapel. 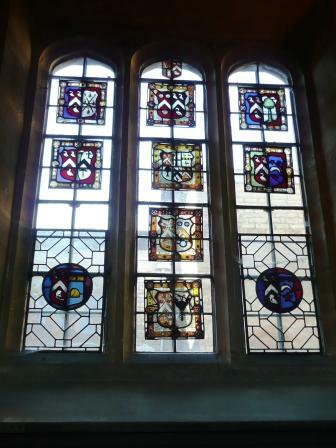 Today we can see the C16 stained glass in the Hall windows. 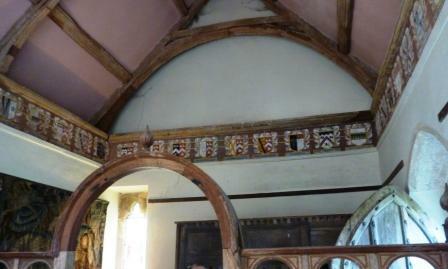 It was originally in the Parlour and Chapel windows but was removed probably when the house was sold in 1755. It was returned to the house by the historian Sir Henry Maxwell–Lyte in the early C20. 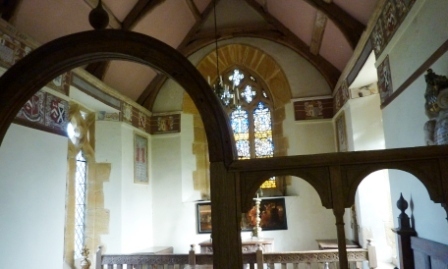 Behind the chapel extends the south wing with its beautiful Great Parlour and Little Parlour and the Great Chamber and Little Chamber above. These were completed in the 1530s. These bright rooms with large windows can be seen in this photograph taken from the South. 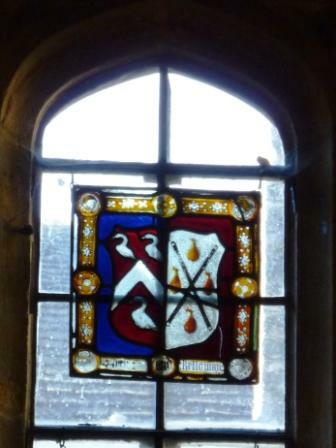 Above the main window are the arms of the Lyte family impaling Horsey for the marriage of John Lyte to Edith Horsey in 1520, a union which greatly increased the wealth and prestige of the family. Thomas was fascinated by genealogy and kept meticulous notes recording the family papers and family records in his COMMON PLACE BOOK which is full of interesting details of the family, its lands, disputes and dealings. He produced a beautifully illustrated family tree for the Lytes and, because of his interest, when he restored the Chapel in 1631 he added a frieze of family coats of arms which reveal a rather interesting family link to some famous descendents. Only a very few new coats of arms were added after his death. In order to trace the link to famous and even royal descendents we must return to the brother of John Lyte (who married Edith Horsey). John had a brother William who married DOROTHY KELLAWAY, DAUGHTER OF SIR JOHN KELLAWAY OF ROCKHAMPTON about 1537, she was the Widow of John Buller of Wode. John Lyte had several disputes with this brother over property. BLACK WILL LYTE AND DOROTHY KELLAWAY had six children and it is via the youngest daughter Gertrude that our famous links occur. GERTRUDE LYTE married THOMAS HOWARD 1st VISCOUNT BINDON as his second wife. He was the son of the Thomas Howard, 3rd Duke of Norfolk and Lady Elizabeth Stafford. This Duke of Norfolk was uncle to Ann Boleyn and Catherine Howard both wives of Henry VIII and both beheaded by him. Thomas Viscount Bindon and Gertrude had two children Charles, an ancestor of the Marquess of Bath, and Ann Howard. ANN HOWARD married SIR WILLIAM THORNHURST about 1590 and they had three children: Grace Thornhurst who married Fane Mildmay 2nd Earl of Westmorland, Sir Gifford Thornhurst who married Susan Temple and Frances Thornhurst who married Sir Robert Napier of Luton Hoo, a wealthy merchant who was knighted and created baronet in 1611. These are illustrations of the Chapel Arms painted 1631 showing many family connections. This was a century after the stained glass windows were completed for the great hall. Arms for all branches of the family are shown. Those above have links to the marriage of William Lyte and Dorothy Kellaway . Below are the arms of their children and husbands. Also the Arms of Jane Smyth (daughter of Henry Lyte and Agnes Kelloway of Cullompton). SIR GIFFORD THORNHURST and SUSAN TEMPLE had a daughter Frances. FRANCES THORNHURST married RICHARD JENNINGS in 1648 and had three children: Ralph, Frances and Sarah. SARAH JENNINGS married JOHN CHURCHILL, 1st DUKE OF MALBOROUGH and so became the 1st DUCHESS OF MALBOROUGH. JOHN CHURCHILL AND SARAH JENNINGS had 7 children one of whom was Ann Churchill. ANN CHURCHILL married CHARLES SPENCER 3rd Duke of SUNDERLAND and that leads us to the SPENCER-CHURCHILL family and eventually to SIR WINSTON CHURCHILL and even to LADY DIANA 1st wife of PRINCE CHARLES and mother of Princes WILLIAM and HARRY. So DOROTHY KELLAWAY was 3 x Gt Grandmother of SARAH JENNINGS, 1st DUCHESS OF MALBOROUGH and an Ancestor of our WW2 Prime Minister and of our future King. 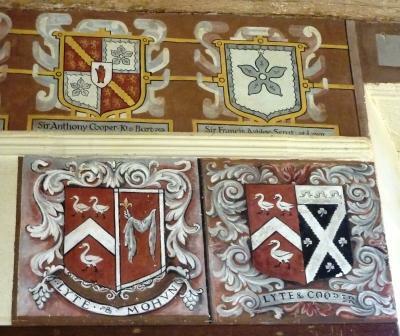 The Ancestry is in the coats of arms in the chapel of the beautiful Manor of Lytes Cary, Somerset. The Lyte family got into debt and had to sell the house in 1755 after which it was leased to tenants and much neglected until it was bought by Sir Walter Jenners and his wife Flora in 1907. He extended and restored the house leaving the historic core of the house largely untouched. Both Jenner′s children died before Sir Walter and he decided to bequeath the property to the National Trust on his death in 1948. 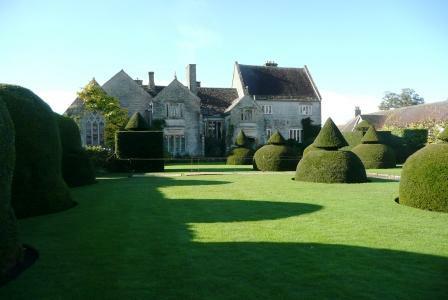 Today it is surrounded by lovely gardens and is a very interesting house to visit even without our Kellaway links.